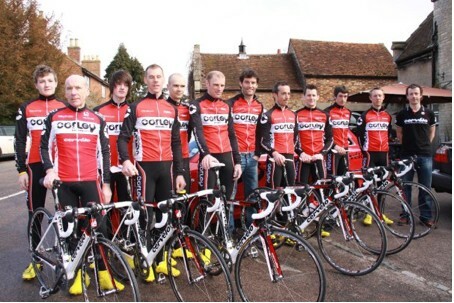 Team Corley Cycles unveiled its full line-up of riders in an informal gathering at the weekend at The Stag, a restaurant co-owned by Formula One driver, Mark Webber who is also the honorary president of the team. The team will tackle the Premier Calendar and the Tour Series – as it did last year – but with the added addition of three locally-based young riders: Jake Hales, Jack Waller and Luke Smulders. “We wanted to give young, local riders something to aim for, to give them a chance to develop as racing cyclists,” explained team patron Phil Corley, himself the 1978 British Road Race champion. “In part we’ve linked up with Team MK, another of Milton Keynes local clubs, in forming this development squad and we’re really hoping that these three riders grasp this opportunity with both hands”. To be re-invited to the Tour Series was an important milestone for the team. “Riding the Tour Series means that we’ll all have to plan our racing year very carefully as the Tour races are much shorter that the Premier Calendar events,” explained Simon Gaywood, himself the winner of the 2003 Elite Circuit Race Series. Simon Holt returns to Italy this season for a second crack at making the cut in Italian amateur racing after a less than successful season last year. The Briton rode for an amateur team in the early part of the year but returned home to ride for CandiTV after finding the former to be a poor set-up. Holt will ride this year for the Elite U23 amateur team UC Bergamasca based in Bergamo. “I have had two race weekends now – both in Treviso – racing rounds of the DI Nardi Sprint Challenge series which is held in the early season in the Veneto region,” Holt explained. “The first weekend and first race on Februrary 27 I placed 10th in San Michele Di Piave and this Sunday (yesterday) I placed 12th in Mareno di Piave, both of which were bunch sprints. You can read more about Simon Holt in this Thursday’s Cycling Weekly. Former John Ibbotson-funded and Magnus Maximus Coffee rider Dan Patten will ride in Belgium this year for the Asfra/Flanders Racing Team. Patten is living in the heart of Flemmish Belgium, Oudenaarde; a well-trodden path that, over the years, has produced more than its fair share of professional riders. Before racing, the Essex man had pre-season tests done in the lab: “it showed I’m hitting the season in good shape so hopefully I’ve got a good season ahead,” Patten explained. “I started racing with Ghent-Staden, on the same day as Kuurne-Brussels-Kuurne, so the weather was atrocious and needless to say not many finished. There were a lot of crashes and a lot of very cold riders so it was a bit of a wash out. “I also kick started my kermesse campaign yesterday with a 5th place in Lierde, almost taking the win. I felt like I just needed to race hard so I attacked early and was soon to be joined by some of the big hitters,” Patten enthused. “It turned out that I was away for the rest of the race. Even when the front group reformed a bit I went again with something like 30km to go and it was to be the decisive move, as 10km or so later, I was joined by another small group of riders and that was how it would be to the finish. “I ended up with 5th though just a few seconds shy of the win, so a good solid way to open and something to build on,” he added. Team Sprocket run by Martin McCrossan and Magnus Backstedt has released details of its continental race programme for the next few months. The team race the GP Lilliers in France yesterday and will then head to Belgium for the Oomloop Waasland on March 14. From there, the team will then contest the Nokere Koerse, again in Belgium on March 17.